Use it or Lose It Challenge! Growing up, my mom displayed favorite china in the dining room hutch. We rarely used it. In fact, she gave me some plates that my grandmother had given to her when I was a kid – price stickers still attached! I have been guilty of doing the same. 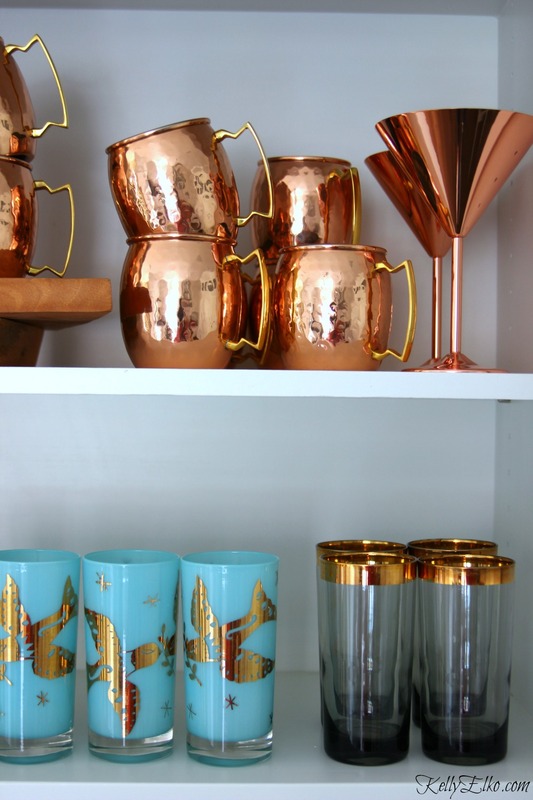 Storing favorite finds away for a special occasion that never seems to come. I’ve changed my ways and seen the light and believe those special finds should be used and enjoyed. we will start using and enjoying our things every single day! My girls were in search of Hawaiian shirts for Halloween so off we drove to the thrift store this weekend. 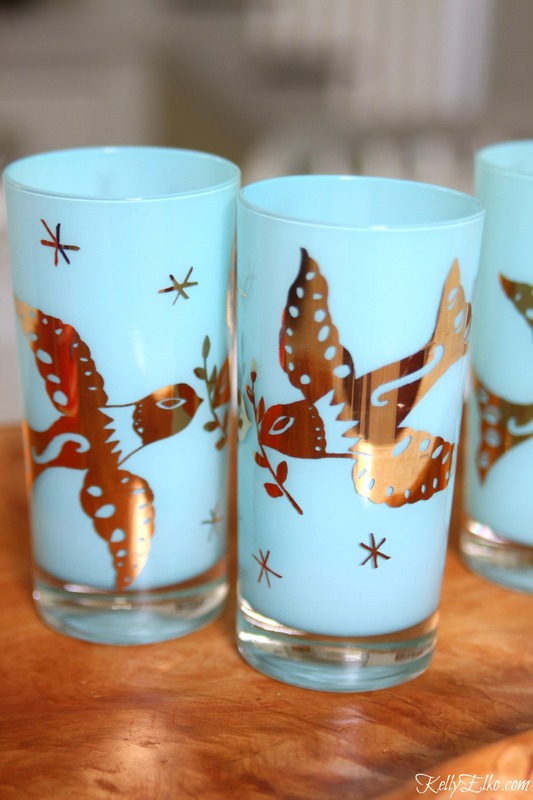 It was my lucky day because while they found the mother load of ugly floral shirts, I found these amazing mid-century, blue with gold doves, never before used drinking glasses (they obviously didn’t share my view of using them) of my dreams. I’m actually drinking out of them! So yesterday, my girls and I sat down to pour through cookbooks to decide what desserts we want to whip up this fall. 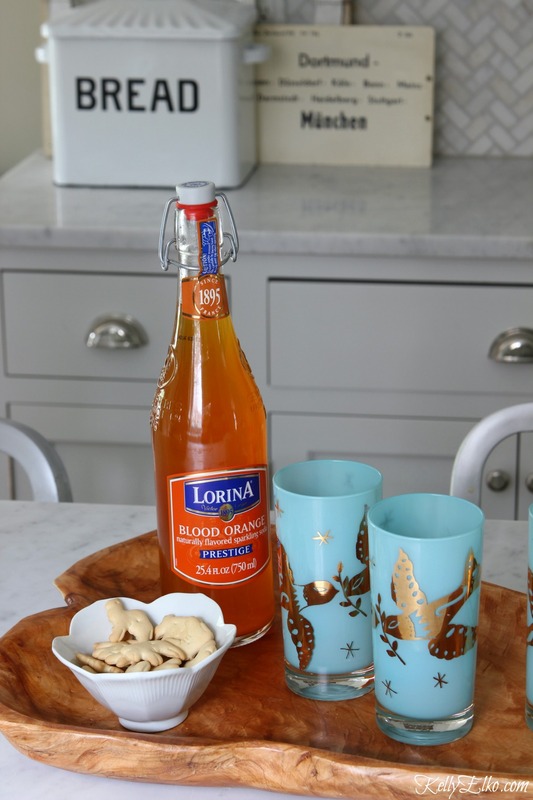 We drank orange soda out of those blue glasses and munched on animal crackers. Sure, I’ll still rotate my finds since I don’t have enough room to display everything all at once and that is ok.
Leave me a comment letting me know what you dig out of storage and finally put to good use. I love this idea and, I too, use it. There have been so many times I’ve bought something precious at a thrift store or an estate sale for literally next to nothing and used it for years. With 3 children I’ve had to adjust my level of comfort in using these “treasures” in everyday life and accept the motto “Easy come/Easy go!” It’s hard to stay mad when a $3.00 beautiful bowl is accidentally broken when at least it graced our table for 3-4 or more years. At least we had the benefit of loving and enjoying it while we had it! Many times I will photograph a beautiful item just so in case it is broken we can remember how beautiful it was. Brilliant idea!! I’m going to take photos of my china, ets. Exactly! I used to be crazed if something got chipped but now I figure it’s better to enjoy it! I can’t tell you how many of my Looney Tunes glasses have been broken – poor little Tweety bird! I usually use a white ceramic bottle from BB and Beyond for my olive oil. I don’t like just putting out the olive oil bottle on the counter and it and the holder for the balsamic vinegar are the two things I leave on the counter. In a thoughtless moment, I broke the bottle a few weeks ago. As I was thinking about a replacement, I spotted a beautiful white carafe/bottle from Italy with a cork/white ceramic stopper in it that belonged to my husband’s parents setting in my china cabinet. It’s truly beautiful And functional so there it is, on my counter next to the stove. I’m trying to be careful that it, too, doesn’t end up on the floor like its predecessor!!! You’re right; things should be enjoyed, although my husband’s mother may be turning in her grave right now!!!! Fingers crossed that your MIL’s bottle stays safe Eileen! I also believe in using my fabulous finds. I have a lot of linen hand towels my grandmother gave to me and I use them in my bathroom everyday. I love your glasses, perfect for orange soda and animal crackers. Your hand towel collection sounds beautiful Jaime – I’m sure your grandmother would be thrilled that you use them every day! I love this post! You would go nuts in my attic tons of vintage boxes, I redecorated my home last year very minimalistic , I think your idea of adding a treasure here and there is a brilliant idea. Thanks for the inspiration I’m going to do it. I’m getting ready for the One room Challenge, and Ill try to add something from my attic each week to the posts. I want to raid your attic Maria! Good luck with the one room challenge! Downsizing is hard Jeannie! There is definitely always room for things we love – even if that means getting rid of things that don’t have as much meaning. I can’t believe how many unwanted ads are covering your post. It definitely took away from enjoyment of reading your post. I have been using the gorgeous silver serving pieces that I inherited from my mother-in-law for years now. I used to keep them bundled up and hidden, but I have really enjoyed using them on a daily basis. They make the ordinary seem extraordinary, and put a smile on my face every time! 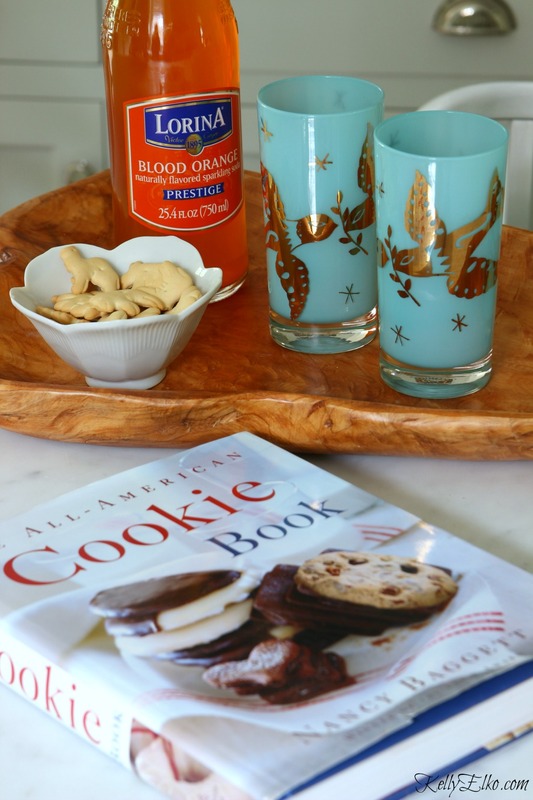 Oh – and I’m seriously dying over your fantastic blue and gold dove glasses! LOVE! Your serving pieces sound gorgeous Jennifer! I have loads of old silver too that I keep in a big ice bucket. The problem is the tarnish and I don’t feel like cleaning them so they just look pretty out on display! Great idea to USE treasured items! I’m not up for the challenge this week but maybe I will be next time! Thank you Brenda – when you’re ready, jump right in! LOVE those glasses! What a find! Thanks Tammy – I may have did a little dance in the thrift store aisle (and embarrassed my girls in the process)! Kelly, there is nothing I love more than to reuse items that are from my families’ estates or to scour an estate sale for a bargain – which is actually a treasure – that no one wants….something about repurposing or better yet, resurrecting a long, lost piece and giving it a special place in my home. I love your blue glasses with the gold doves!!!!! They are reminiscent of days gone by…..a tranquil thought amidst this crazy world. Take care. I have never seen anything like these glasses Anna – I was so excited to find them! I googled them and could not find them – which makes them extra special to me. Enjoy those estate sales – my favorite places to get unique finds! Love your ideas! I too believe “Why have it if you don’t use it?” (My jewelry can attest to that)! I also believe in the habitat store 🙂 which I just left with 3 doors to use in an upcoming show for displaying my hand made wreaths! A little paint, a door hook or 6 and hand made stands by honey and I’m in business. Now when I display my wreaths my customers can actually see what they look like on a door :)! Now I need to go back to the goodwill stores and see what kind of wreaths I can score to remake. Wahoo nothing like a steal that can be used for a whole other purpose. I love that you use old doors to display your wreaths Mary! 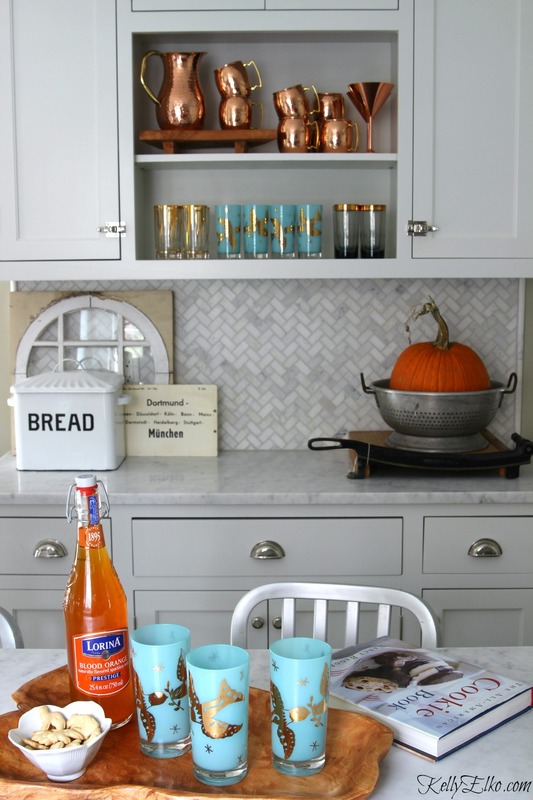 Great inspiration for display and utilize treasures! Thank you Jenny – hope you’re enjoying your treasures too! Yes! Does this give me permission to take that beautiful china set that I inherited from my Aunt years ago and finally use it! It’s drop dead gorgeous Spode china. It sits in the china cabinet waiting for Christmas each year. What a shame! I love your idea. I think I will fetch it this afternoon and set tonight’s dinner table with it! You go girl! I am thrilled to hear that you are digging out your china Kathy! Enjoy it and cheers! Such a great idea! Those glasses are beautiful but be sure to hand wash them. I am going to dig out something from my china cabinet today and use it! That is the only problem with old glasses and china – the hand washing. But I dutifully do it to keep them looking amazing! Love your glasses–such a pretty color. I bought a couple of nice crystal glasses for $1 each at the a house sale or thrift store and we are drinking water or whatever out of them. If they break–no big loss—that is value of thrift to me. Less emotional investment in the piece. I still worry about using the heirlooms, but dutifully pull out grandma’s china at Christmas since it is doing no good packed away. My family loves to see it. Just have to be careful with washing it. Love all your collections! I love finding glasses at the thrift store! Definitely makes it easy to stomach if one breaks. I have my MIL’s old Lenox Christmas china. It’s not really my style but my hubby loves it so I break it out every year. Hi Kelly, I’m new to your web site. But I totally love everything about you and all you say. I’m going to jump in on this and just start using my great finds. My grandkids will love using my Morton Salt cearel bowls and my Snap Crackle and Pop cearel bowls. No more checking them out up on the ledge of my shelf above the kitchen cabnits. It’s going to be a hands on kid of fun. I wish I could send a picture just so you could see how great they are. But thanks Kelly for this challange. Wow – sounds like you have some amazing finds Loni! I’m sure your grandkids will be thrilled to finally be able to use them. I would LOVE to see a pic of your bowls! Okay i’m in but it may take a while. I have been going thru a lot of stuff,got rid of some coffee mugs and pulled out the rest to use. Thanks Kelly. Funny, I just sold a bunch of coffee mugs on a FB page last week. How many does one girl need?! I except the challenge! I started a few weeks ago decorating for fall, and ran across a tote from my daughters wedding,(10 years ago) with fall flowers and so used them above my kitchen cupboards !!! Motivated to go thru things and use it or lose it! Thank You!!!! Awesome Renee! It’s so freeing to get rid of things that are cluttering up our lives! Hm, can’t think off the top of my head what I’d use but I’m going to dig and see what I come up with. I actually gave my mom’s china to one of my sisters…I wasn’t using it and it was taking up valuable space. I think I will run across more than I care to admit tucked away and not being used. Love your pretty glasses! It’s amazing what we forget we have when we start searching in cabinets and boxes! Ha, here’s a good one. Sitting on a bathroom shelf in full view no less, is a box of scented, pretty soaps. I’ve had them for years. They were meant to be used, so why haven’t I? Good grief! Pulling those babies out and using them! YES – use those soaps! I brought some soaps home from Paris last year and they just sat in a jar looking pretty until I decided to actually use and enjoy them! Enjoy Cecilia! LOVE your glasses and this concept! i have some things that need to go and have a giant pile ready for a yard sale this coming spring! I want to go to your yard sale! But I need to have one of my own! It’s a vicious cycle! Score! Those are great glasses!! Thank you Kathryn – I was thrilled to find them! I also found some very pretty,gold-etched cocktail glasses in a box. My basement is like going on a treasure hunt. One surprise after another! Cheers! I love finding things I forgot about in my own house – enjoy those glasses – cheers Katie! I just found this post and I totally agree. I have so many items that I love to use that are old discoveries. I use old silverplate, have special glasses and I usually eat off diner crockery. Yes, there is always the chance that something may get broken, but it hurts my heart when I find something old that someone “saved for good” and never used and enjoyed thier treasures. I understand how people cherished special things, but that thinking resulted in their never having the pleasure of using items that were propably gifts…and now, I have them. Oh, well, at least someone is enjoying and USING them now. I have lots of old silver-plate too Susan – it’s so pretty (just a pain to keep tarnish free)! Enjoy those finds!